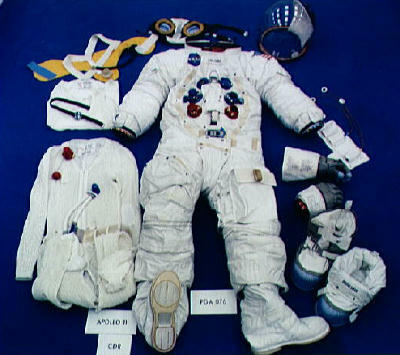 Components of the Apollo spacesuit. Orlan DM space suit with built-in life support system. 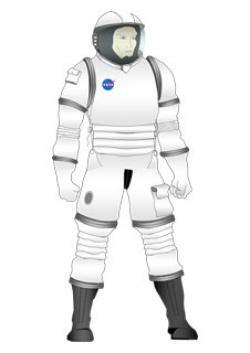 Future spacesuit to be worn during takeoff and landing of the Orion spacecraft. A spacesuit is an airtight fabric suit with flexible joints that enables a person to live and work in the harsh, airless environment of space (see space survival). A spacesuit maintains a pressure around the body to keep body fluids from boiling away, a comfortable temperature, and a supply of oxygen. The modern spacesuit is a development of the pressure suits worn by early high-altitude pilots. Pressure suits were suggested by the British physiologist J. B. S. Haldane as long as 1920 but first built in 1933 by the B. F. Goodrich company for the pioneer American aviator Wiley Post. By wearing a pressure suit, Post was able to fly his celebrated supercharged Lockheed Vega monoplane, Winnie Mae, in December 1934 to an altitude of 14,600 meters. By the end of the decade, other nations had flown generally similar suits, and, in 1938, Italian pilot Mario Pezzi reached an altitude of 17,080 meters – a record that still stands for a piston-engine airplane. The spacesuit worn by the Mercury astronauts was a modified version of the United States Navy high-altitude jet pressure suit. It had an inner layer of Neoprene-coated nylon fabric and an outer layer of aluminized nylon that gave it a distinctive silvery appearance. Simple fabric break lines sewn in to allow bending at the elbow and knee when the suit was pressurized tended not to work very well: as an arm or leg was bent, the suit joints folded in on themselves reducing the suit's internal volume and increasing its pressure. Fortunately, the Mercury suits were worn "soft" or unpressurized and served only in case the spacecraft cabin lost pressure. Individually tailored to each astronaut, they needed, in Walter Schirra's words "More alterations than a bridal gown." For the Gemini missions, which would involve astronauts intentionally depressurizing their cabins and going on space walks, mobility was a crucial issue. To address this, designers came up with a suit that consisted of a gas-tight, man-shaped pressure bladder, made of Neoprene-coated nylon, covered by a layer of fishnet-like fabric called Link-net woven from Dacron and Teflon cords. This net layer, served as a structural shell to prevent the bladder from ballooning when pressurized. Next came a layer of felt, seven layers of insulation to protect against temperature extremes, and an outer nylon cover. The suit was pressurized at one-quarter atmospheric pressure and oxygen piped in from the spacecraft's life-support system through an umbilical cord. The Apollo missions posed spacesuit designers with a new set of problems. Not only did the Moon explorers' outfits need protect against sharp rocks and the heat of the lunar day, but they also had to be flexible enough to let astronauts stoop and bend to collect lunar samples, set up scientific equipment, and drive the lunar rover. Apollo spacesuit mobility was improved over earlier designs by using bellows-like molded rubber joints at the shoulders, elbows, hips and, knees. Further changes to the suit waist for Apollo 15–17 added flexibility making it easier for crewmen to sit on the lunar rover. A Portable Life Support System (PLSS) backpack, connected to the suit by umbilicals at the waist, provided oxygen, suit pressurization, temperature and humidity control, and power for communications gear for moonwalks lasting up to 7 hours. A separate 30-minute emergency supply was carried in a small pack above the main PLSS. The Gemini missions had taught that strenuous activity in space could soon cause an astronaut to overheat. 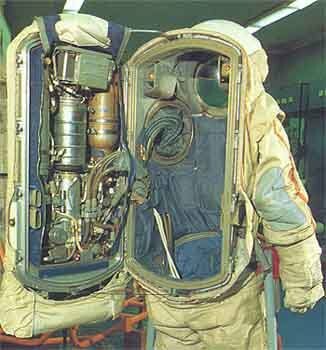 So, from the skin out, the Apollo A7LB spacesuit began with a liquid-cooling garment, similar to a pair of long-johns with a network of tubing sewn onto the fabric. Cool water, circulating through the tubing, transferred metabolic heat from the astronaut's body to the backpack and thence to space. Next came a comfort and donning improvement layer of lightweight nylon, followed by a pressure bladder, a nylon restraint layer to prevent ballooning, a lightweight thermal super-insulation of alternating layers of thin Kapton and glass-fiber cloth, several layers of Mylar and spacer material, and finally, protective outer layers of Teflon-coated glass-fiber Beta cloth. The fishbowl-like helmet was formed from high-strength polycarbonate and attached to the spacesuit by a pressure-sealing neck-ring. Unlike Mercury and Gemini helmets, which were closely fitted and moved with the crewman's head, the Apollo helmet was fixed and the head free to move within. While walking on the Moon, Apollo crewmen wore an outer, gold-coated visor to shield against ultraviolet radiation, and help keep the head and face cool. Completing the Apollo astronaut's ensemble were lunar gloves and boots, both designed for the rigors of exploring, and the gloves for adjusting sensitive instruments. Modified Apollo suits were also used on the Skylab missions and the Apollo-Soyuz Test Project. During ascent to and descent from orbit, Space Shuttle astronauts wear special orange partial pressure suits with helmet, gloves, and boots in case of a loss of cabin pressure. Once in orbit, crew members inside the Shuttle enjoy shirtsleeve comfort. To work in the Shuttle's open cargo bay or perform other tasks outside the spacecraft, they don spacesuits known as extravehicular mobility units (EMUs), more durable and flexible than any previous suits. The EMU is modular enabling it to be built up from a number of parts depending on the particular task in hand. Also, the upper torso, lower torso, arms, and gloves are not individually tailored but made in a variety of sizes that can be put together in combinations to fit any-sized crew member, man or woman. Each suit has supplies for a 6.5-hour spacewalk plus a 30-minute reserve and is pressurized to just under one third of atmospheric pressure. Before donning the suit, astronauts spend several hours breathing pure oxygen because the suit also uses 100% oxygen whereas the habitable decks on the Shuttle use an Earth-normal 21% oxygen/79% nitrogen mixture at atmospheric pressure (reduced to 0.69 atmosphere before an EVA). This preparation is necessary to remove nitrogen dissolved in body fluids to prevent its release as gas bubbles when pressure is reduced, a condition commonly called the bends. The following parts of the EMU go on first: a urine-collection device, a liquid-cooled undergarment plumbed with 100 m of plastic tubing through which water circulates, an in-suit drink bag containing 600 grams of potable water, a communications system (known as the Snoopy Cap) with headphones and microphones, and a biomedical instrumentation package. Next the astronaut pulls on the flexible lower torso assembly before rising into the stiff upper section which hangs on the wall of the airlock. The upper torso is a hard fiberglass structure that contains the primary life support system and the display control module. Connections between the two parts must be aligned to enable circulation of water and gas into the liquid cooling ventilation garment and return. Then the gloves are added and finally the extravehicular visor and helmet assembly. The pressure suit worn by Vostok cosmonauts was hidden under an orange coverall and the Voskhod 1 crew flew without spacesuits at all. 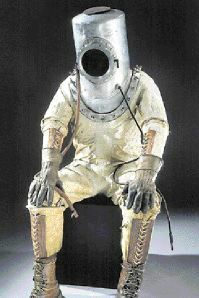 Alexi Leonov were a special suit for his Voskhod 2 spacewalk in 1965 that drew supplies from a backpack, suggesting that this may have been a suit designed for use on the Moon. Four years later when the crew of Soyuz 4 transferred to Soyuz 5 they wore a modified suit with no backpack, but with air supplies attached to their legs. After the Soyuz 11 disaster all Soviet cosmonauts wore pressure suits during launch, docking and landing, but began wearing the so-called Orlan spacesuit for EVAs. Versions of the Orlan suit have been used by cosmonauts on Salyut and Mir missions, and now for ISS spacewalks. It consists of flexible limbs attached to a one-piece rigid body/helmet unit which is entered through a hatch in the rear of the torso. The exterior of the hatch houses the life support equipment. In June 2008, NASA handed a contract to US firm Oceaneering International to develop a new spacesuit to coincide with the first scheduled launch of the Orion spacecraft in 2015. Two versions of the suit were to be built. The "default" version would have been worn during launch and landing of Orion, trips to the International Space Station, and for spacewalks. The other version would have been lighter and more flexible, and designed for use by astronauts on the Moon's surface. However, the Constellation Program was subsequently cancelled.